The new documentary "Fight for Space" explores how U.S. presidents have tried to make their marks on human spaceflight. Each president who comes into office tries to make a mark on space, a new documentary film argues — but the visions of three generations of presidents have not been enough to push us into a science fiction future like "Star Trek." Filmmaker Paul Hildebrandt's new work, "Fight for Space," will premiere Monday (Nov. 14) at the DOC NYC film festival in New York City. Its four years of production included two successful Kickstarter campaigns that each raised $100,000. Hildebrandt conducted 60 interviews in the past three years for the movie, talking with such congressional space committee members as Sen. Bill Nelson, D-FL., a former space shuttle astronaut, and Rep. Dana Rohrabacher, R-CA. "I feel like these congressmen and senators, they believe in the space program," Hildebrandt told Space.com. "They really do care; it's just how they want to make it happen is so different. While space tends to be somewhat unpartisan, they try to find ways to make it partisan." The poster for "Fight for Space," a documentary premiering at the DOC NYC film festival Nov. 14. Hildebrandt described himself as "always kind of a space nut," even though he didn't pursue the space industry as a career. He watched a lot of science fiction, particularly "Star Trek," and checked out all the space books at the school library. When he wanted to start a film career, however, his dreams of making a science fiction film faded as he saw the tough space environment. "It was sort of a downer for me to see this news while trying to write this science fiction film," Hildebrandt said. With his daughter about to be born, he instead started thinking of a documentary to inspire her generation. A space shuttle inspired his generation, Hildebrandt reflected. What would be next? The film cites the Apollo missions as a high point in space exploration history. Hildebrandt's journey began at the National Space Symposium in Colorado Springs, Colorado, in 2012, where scientist and science popularizer Neil deGrasse Tyson — now known for hosting the rebooted "Cosmos" TV series — gave a keynote speech. Hildebrandt and some friends went on their own dime and got several interviews there with Tyson, shuttle astronaut Leroy Chiao and other space advocates. He also stopped in Denver to speak with Robert Zubrin, founder and president of The Mars Society. Hildebrandt ran a Kickstarter campaign in 2012 to raise $60,000 for a small-scale documentary. When he reached $100,000, he elected to go for a feature release. He traveled all over the United States, visiting NASA centers, space advocacy groups such as The Planetary Society, politicians and other people involved in the space field. While the viewpoints presented were diverse, he said he saw two groups with different ideas: Apollo-style people who wanted a presidential directive and a big rocket to go to the moon and Mars, and commercial space advocates looking to create tourism, space mining and space services. 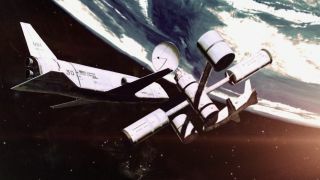 A second Kickstarter campaign in 2015 raised another $100,000 and allowed for several postproduction treats, including archival footage of space and big political events of the 1960s, as well as a score from "Star Trek: The Next Generation" composer Ron Jones. The film should circulate among several festivals before being released online. Details of that release are still being worked out, but Hildebrandt said he hopes to have it widely available as soon as possible. The movie premieres at New York's IFC Center Nov. 14 at 5:15 p.m. EST and will play again Nov. 15 at 12:45 p.m. EST. Information about future screenings will be on the film's website.